Once again I had great fun with these – trying to interpret some of them in different ways. Most of them were taken on my recent trip to Spain. Hope you like them! 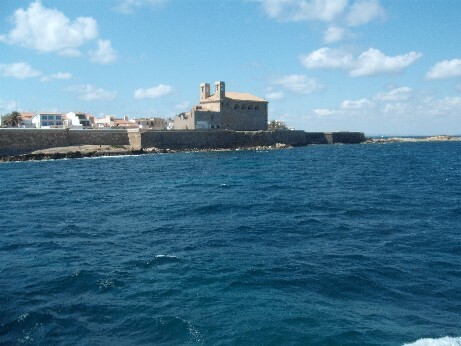 This pic was taken from the boat when we went on our trip to the island of Tabarca and shows the old church which is being restored. 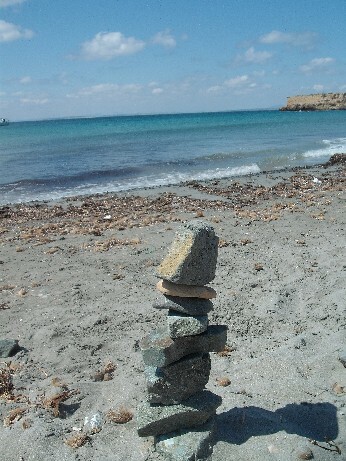 I love the contrast of colours between the blue sea and the stones of the buildings. 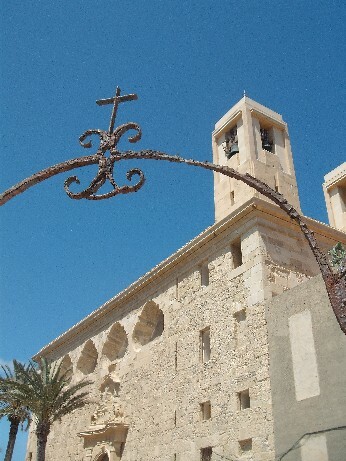 Again from Tabarca, this is taken outside the church and is the cross from the top of an old well. I really like this pic – think it is one for printing off and framing. I did see lots of nice sculptures in Spain as they love public art but then came across this on the beach so thought it was a good one for this category. I wanted something interesting for this as all my personal keys are very boring them I came across this advert for a cross stitch picture which I think is wonderful so I am using this. 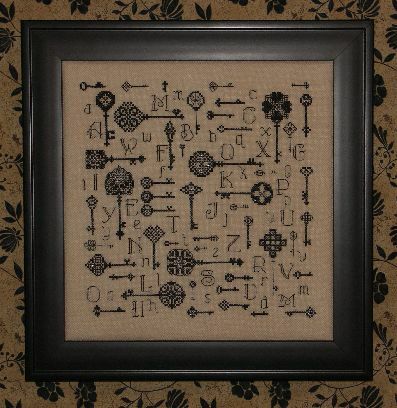 The kit is called Keys to the Kingdom from Rosewood Manor Designs and I am using this pic from their website as I have not got around to ordering this yet. I am going to stitch bits of it as greetings cards – I thought they would be lovely for 18th and 21st cards. Not only an interesting shop name but a very lovely shop. This is my LYS in Huddersfield where I go as much as I can for Knit and Natter! Back to Tabarca for this one which is interpreted a bit differently. 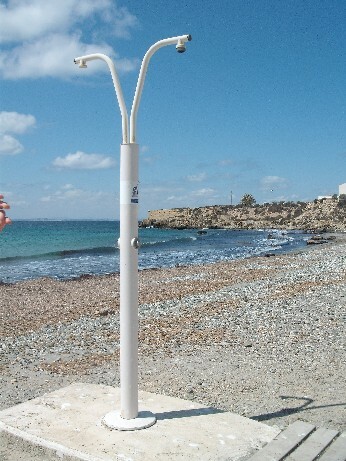 Most of the beaches in Spain have showers where you can rinse yourself off after your stay. Some are just for feet but this is a full size one. So here you have a pic of a shower taken in April! I have posted pics of breakfast before on my blog and I now I get to do it again without seeming strange. 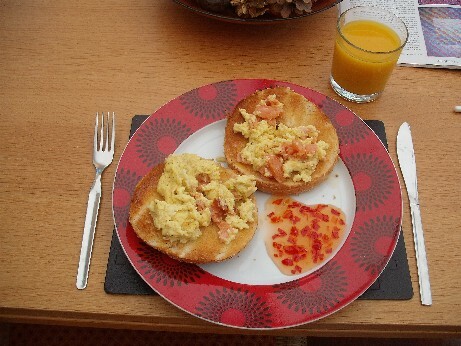 This is my all time fave brekkie which I have for special occasions – scrambled eggs with smoked salmon and bagel – yum yum! I like the way my chilli sauce has formed a heart shape – breakfast with love! 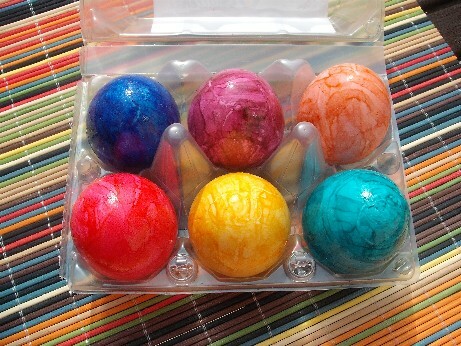 Jake found these in a supermarket in Spain – we were there just before Easter so I guess it must be a Spanish tradition. I was going to use them for scrambled eggs then I thought ‘ I wonder what huevos cocidas actually means? ‘, looking at the label – it means boiled eggs so we had them for picnics instead! 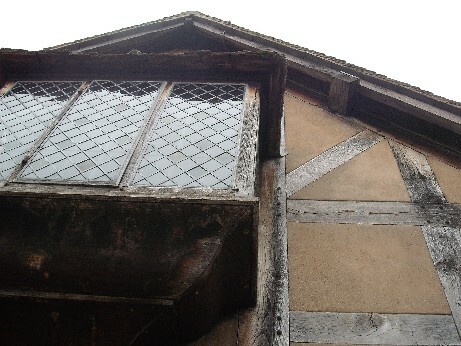 This pic was actually taken in March as we went to Stratford for Ellie’s birthday but I thought the fact that we had actually been to Shakespeare’s birthplace was too good to miss. No pics allowed inside so here is a shot of the house. Again a great one for me as we did a three-day show at Bolsover to celebrate this the other week. 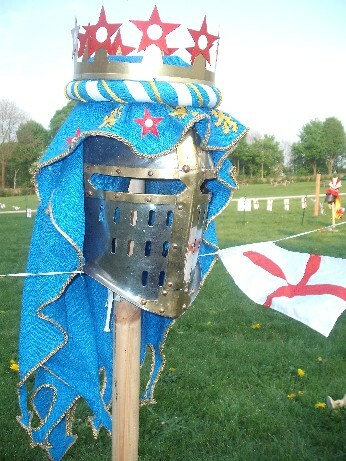 My pic of choice from that is a shot of William de Bohun’s beautifully decorated helm resting on its stand after our show. De Bohun himself was looking a little hot after fighting in full armour in very high temperatures! Again from Spain, these pretty flowers grow wild everywhere, they are all over the beaches and any uncultivated area. I don’t know their proper names, they have very thick fleshy leaves to conserve water and come in pink versions as well. Pic taken using mirror in good old blog tradition! 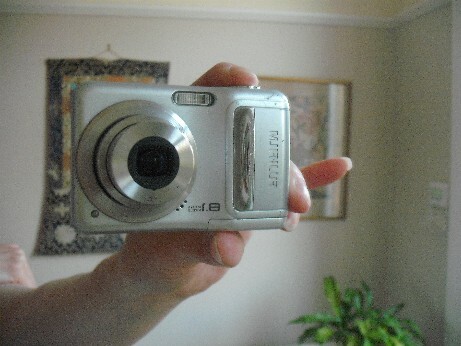 My trusty little camera – on its last legs but still taking some lovely pics – what would my blog be without it! It is a Fuji A850, about 2 years old. ThimbleAnna’s pics can be found here – she’s got a good one for keys and the lists and links to other’s collections are at Kathy’s blog if you want to join in. Thanks for visiting – see you for more craft updates soon! That would be lovely thanks Louise – May is going to be quite a challenge I think, I got a couple today but am going to haveto think creatively about a couple of them! Your pretty yellow flower looks like a succulent groundcover that is used in landscaping on the coast of Southern California, US. 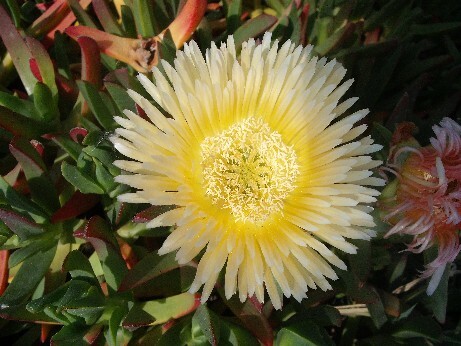 I’ve always heard it called ice plant. It does best in full sun and dry soil. It looks beautiful from midwinter to spring. Thank you – my Mum just calls it the beach plant, they are very pretty and do very well in Spain as there is hardly any rain- unlike Yorkshire! 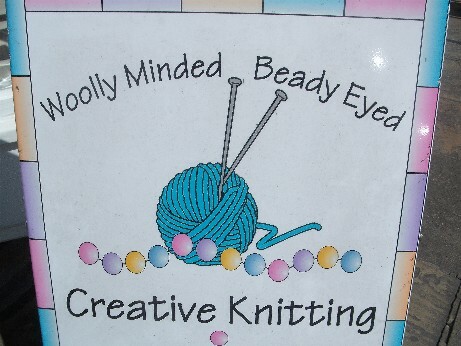 I love your shop name! Thank you very much – I love taking pics in Spain , the light is so lovely and the sky so blue! Thank you for visiting as well – am really enjoying the Scavenger Hunt and seeing everyone else’s pics as well. The ones in spain are stunning as is St Georges Day . just joined the scavenger hunt this month, and loving everyone’s pictures. Hello Joy and thanks for following me – I love the scavenger hunt pics as well. I am working hard on the May list now!